Consumers, who are already being squeezed by rising interest rates (even as the return on their cash deposits remains anchored near zero), are facing another potential constraint on their already limited purchasing power. And that constraint is rising gasoline prices, which, as we pointed out last month, could erode the stimulative impact of President Trump's tax plan as they sop up what little money the middle class has been saving. As prices rise and banks scramble to update their forecasts, the Wall Street Journal has become the latest publication to sound the alarm over what is, in our view, one of the biggest threats facing the US economy in the ninth year of its post-crisis expansion. In its story warning about $3 a gallon oil (of course, we're already seeing $4 a gallon in parts of California and other high-tax states), WSJ cited Morgan Stanley's latest projection that rising gas prices could wipe out about a third of the annual take-home pay generated by the tax cuts. Morgan Stanley estimates that if gas averages $2.96 this year, it would take an annualized $38 billion from spending elsewhere, an upward revision from the bank’s $20 billion estimate in January. That would wipe out about a third of the additional take-home pay coming from tax cuts this year, the analysts said. Patrick DeHaan, petroleum analyst at GasBuddy"Three dollars is like a small fence. You can get through it, you can get over it," said Patrick DeHaan, petroleum analyst at GasBuddy, a fuel-tracking app. "But $4 is like the electric fence in Jurassic Park. There’s no getting over that." Of course, MS's take appears downright pollyannaish when compared with a Brookings Center report that we highlighted last month. The left-of-center think tank, which of course has every reason to hope that the next recession will materialize on President Trump's watch, projected that consumers would soon spend about half of the money saved from tax cuts on fuel costs. And in a report published in April, Deutsche Bank illustrated how rising fuel costs will disproportionately squeeze the most vulnerable among us - a cohort of consumers who already shoulder an outsize share of the country's household debt. 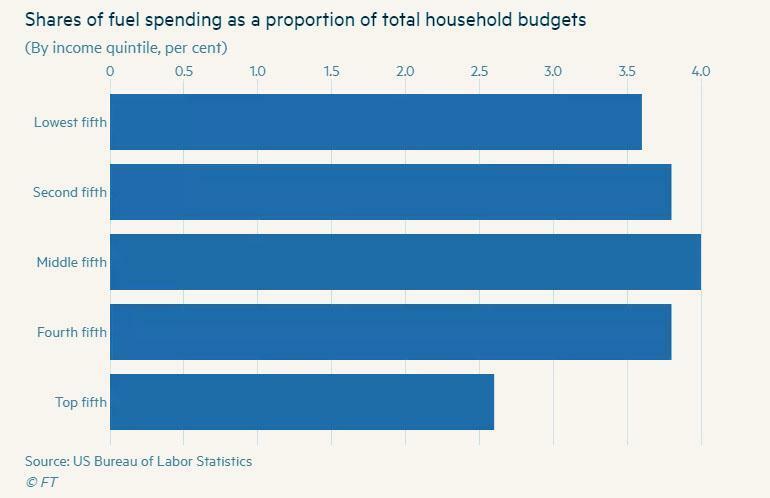 As the chart above shows, middle-income families - aka the engine of consumption - will be the hardest hit by rising gas prices. Indeed, small business owners in California, where gas prices are the fifth highest in the nation thanks to taxes and stringent emissions standards, say they've seen their energy bills shoot higher in the past few months. Car salesmen say consumers are asking more questions about mileage, according to WSJ. Robert Lozano, a car salesman in Los Angeles where some gas prices are already above $4, said the dealership’s gas bill has climbed from about $9,000 to about $12,000 a month recently. Customers are inquiring more about electric vehicles, he said. "It’s more in the consumer’s mind as to what the most efficient vehicle is." ...As the number of Americans intending to take vacations in the next six months climbs to its highest level in decades. Heightened vacation intentions suggest the number of vehicle miles driven will also climb (because people tend to travel greater distances when they go on vacation). 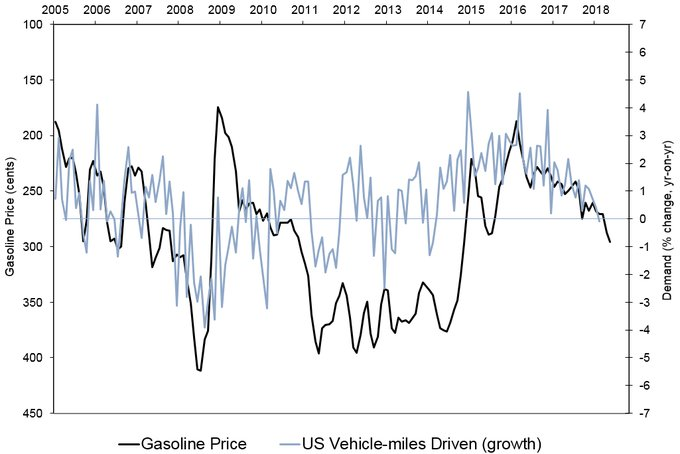 As the chart below shows, fluctuations in miles driven - a close proxy for gas demand - are quickly reflected in prices at the pump. While the US's increasing prominence in the oil-export market could soften some of the economic blow as the energy business booms, other large business from airlines to shipping companies would feel the pinch at a time when costs are already rising. But some economists say the growing importance of energy to the U.S. economy could blunt some of the impact from rising oil prices. The country has become a more prominent supplier of crude oil and fuel. Domestic production has reached record weekly levels of 10.7 million barrels per day and a lot of it is being exported. "People don’t understand how we could double crude oil production" and see higher gas prices, said Tom Kloza, global head of energy analysis at the Oil Price Information Service. "The answer lies in the balance of payment. We are an exporting power right now." Airlines and shipping companies will also be paying more for jet fuel and diesel - costs that may be passed along to consumers. Even companies such as Whirlpool Corp. have noted that higher oil prices have boosted the cost of materials. Refiner Valero Energy Corp. said it wouldn’t expect consumer demand to drop off until oil prices are at $80 to $100. But demand is only one factor driving up oil prices. Supply issues have also weighed on oil traders' minds. Traders pushed oil prices higher as the US pulled out of the Iran deal as some worried that it could impact global supplies (though, as we've pointed out, there are plenty of other buyers waiting to step in and buy Iranian crude). Even if the Iranian crude trade isn't impacted by sanctions, plummeting production capacity in Venezuela could ultimately have a bigger impact on global supply. Conflicts in other oil producing regions could also impact supplies, pushing prices higher. Last week, Bank of America became the first Wall Street bank to call $100/bbl for Brent crude (at the time, it was trading around $77/bbl) in 2019. That could send prices to highs not seen since 2008. Other banks have been scrambling to raise their forecasts as well. With the Fed changing its language in its latest policy statement to reflect rising inflation expectations, rising oil prices could also inspire the Fed to hike interest rates more quickly for fear that the economy might overheat. That could result in four - or perhaps five - rate hikes this year. Unexpectedly weak consumption - which is responsible for two-thirds of US economic growth - helped constrain GDP growth during Q1. The resulting effect would be like economic kudzu strangling the buying power of consumers and possibly forcing a long-overdue debt reckoning as millennials, who are already drowning in debt, are forced to put off home ownership and family formation until they're in their late 30s or even their 40s.